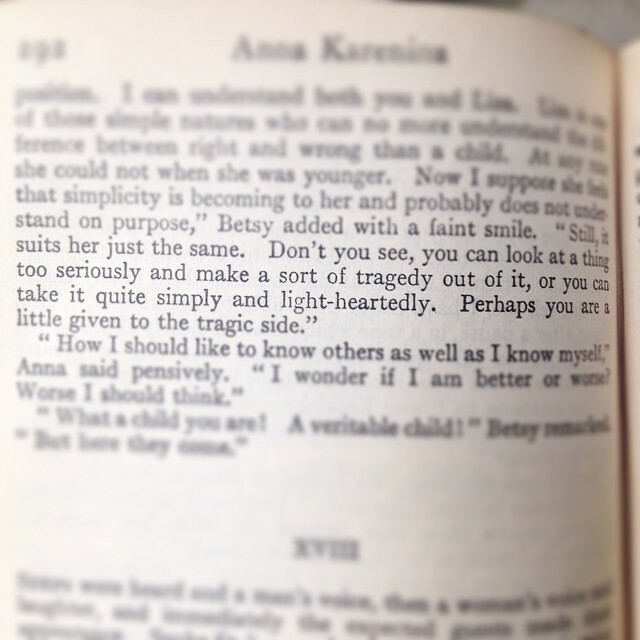 For the past twenty years or so, a copy of Anna Karenina has sat on my bookshelf. It has travelled with me to the various places and spaces I have lived, but in all honesty, the book is virginal; its spine has never been cracked. I always felt I should read this book – it’s a classic, after all – but the Penguin paperback I have runs to 853 pages. It is a mighty tome with fine paper and tiny text. I have tried and failed many times to get into this story, but before too long my eyes glaze over, growing weary of the words, spirit sapped by the novel’s sheer length. Basically, I thought it was way out of my league. Anna Karenina was highbrow, more suited to the literati than to common-or-garden me. Several years ago, I happened upon a gorgeous, green, two-volumed hardback edition at the Sunday market down the road. My friend (a massive fan of the Russian greats) heartily recommends reading them this way, if at all possible – it breaks up the mammoth task into smaller chunks so you get to feel a sense of accomplishment when you finish the first volume. Still, Anna Karenina remained untouched. It was only after reading the superb “If You Want To Write” recently, that I was inspired to pick it up again. The way Brenda Ueland wrote about Tolstoy got me curious. So… I cracked its spine. And, Reader, it is wonderful! It’s a sharply observed, plainly, yet beautifully written soap opera. Tolstoy has an eye for the ordinary – a microscopic attention to the minutiae that make a character come alive. But, more than that, it is a brilliant portrayal of how we only ever see and feel what we think. But she was not listening to his words; she was watching the expression of his face. She did not know that the expression arose from the first thought that occurred to him, about the inevitableness of a duel. The idea of a duel never entered her mind, and so she interpreted the sudden severity otherwise. Time and again, a character misreads the words and gestures of another. Time and again, they are filling in the gaps, failing to speak from the heart – forever missing the opportunity to connect. Time and again, they are captives to conventions and constraints, to all the shoulds and coulds that deaden us to life. They are so thought full they’ve become blind. It is tragic. But this is what we do. We innocently walk through life, making up our story, then act and react from that which we have made up, never dreaming that our story is not, nor ever could be, the Truth of us. I thought Tolstoy was beyond me. I thought reading Anna Karenina would be bit of a chore; I thought it would be a heavy read. In truth, the only heavy thing about it was my thinking, this whole narrative I had penned in invisible ink in my mind. But, I am slowly waking up to these unseen words. I am slowly realising that they are all made of Thought. And I am grateful for a chance to think again. To have the opportunity to take a fresh look at life. To find the richness of the human experience within the pages of a Russian novel. But to, ultimately know that we, and we alone are the creators of our own reality. You create the world you live in. Yet, you have to find this for yourself. Listen carefully. Not just to what I’m saying, [but] to some wise person that YOU think knows the secret. You can go to the library, you can find the Truth. You can go to the church of your choice and find it. You can go to a Kahuna and find it. You can go anywhere in the world, and once you know what Truth is, you’ll hear it spoken all over the world.